John Piper aims to show us how God works through his written Word when we pursue the natural act of reading the Bible. Does it take a miracle to read the Bible? God wrote a book, and its pages are full of his glory. But we cannot see his beauty on our own, with mere human eyes. In Reading the Bible Supernaturally, John Piper aims to show us how God works through his written Word when we pursue the natural act of reading the Bible, so that we experience his sightgiving power—a power that extends beyond the words on the page. 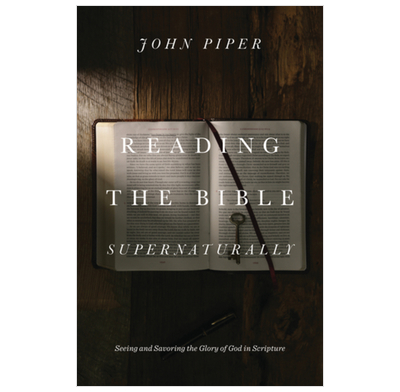 Ultimately, Piper shows us that in the seemingly ordinary act of reading the Bible, something miraculous happens: we are given eyes to behold the glory of the living God. Propositions: Collections of Nuggets or Links in a Chain? This book should be read with the first volume called A Peculiar Glory. The two books go hand in hand to set forth why we can trust in the accuracy of the Bible, and then in this particular book, how we can allow our understanding of the Bible to supernaturally/divinely change our lives. I particularly love the inclusion of many Puritan authors, including Jonathan Edwards in Piper's arguments and writing. An engaging read.